It has been awhile since I have made an update related to skin cancer. I have been focused on enjoying life since my most recent treatment ended and have placed all those not so pleasant months in the back of my mind. That strategy was working quite well for me until I went to the Dentist for my regular checkup a few weeks ago. She noticed a lesion on the left lateral portion of my tongue. 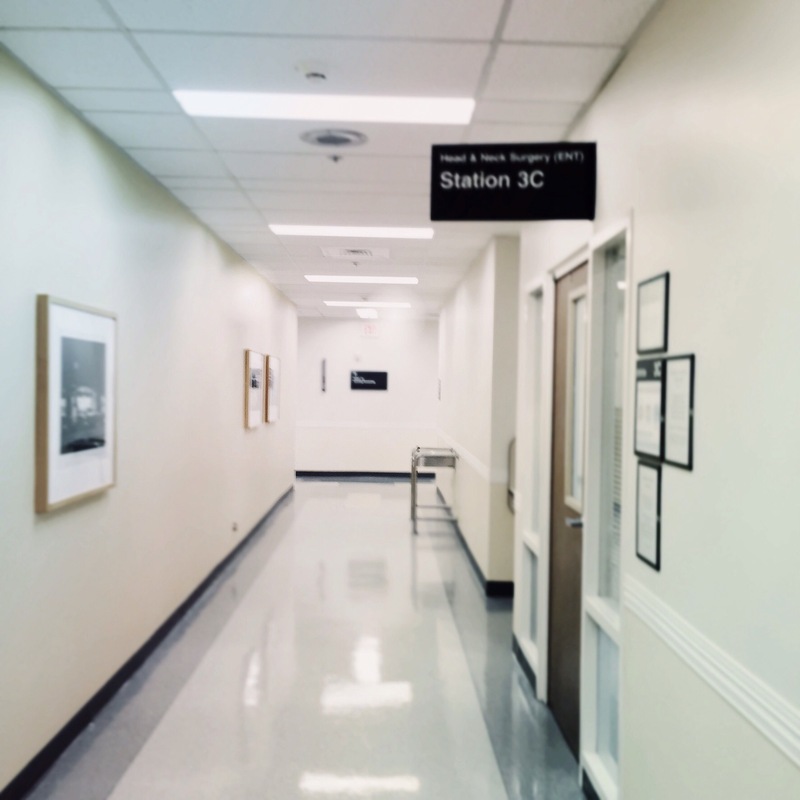 Her immediate thought was something as benign as Migratory Glossitis but due to my history with skin cancer, she felt I should be seen by someone for an evaluation of the lesion. 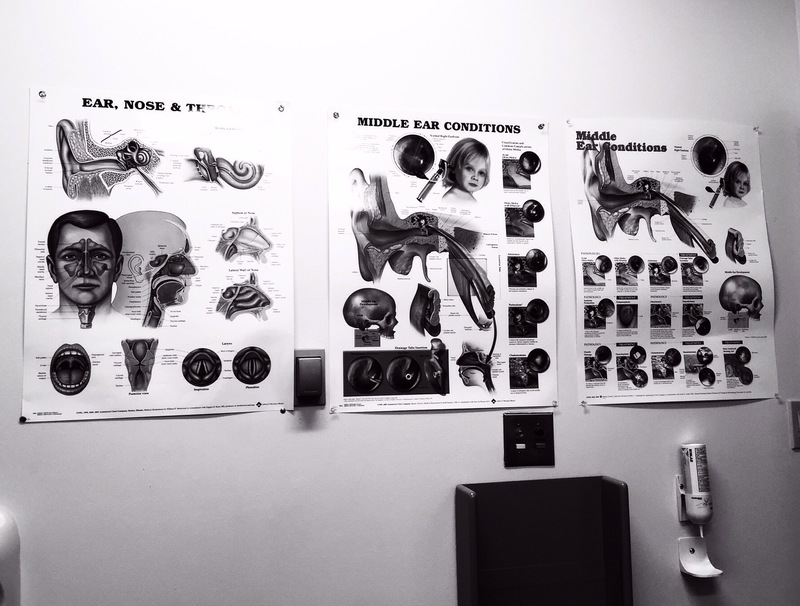 I had already set up my yearly physical with my general practitioner for the following week so when I went to see her she referred me to an ENT surgeon for evaluation the next day. When most of us think about skin cancer we think of lesions that pop up on parts of the skin that have been exposed to UV rays. Cancerous lesions on the tongue or inside the mouth caused by UV exposure is not something we usually hear about. Alas, the ugly beast can spring up inside your mouth in the form of Squamous Cell Carcinoma or Melanoma and According to the American Cancer Society, it can indeed be caused by too much sun exposure over time. This does not mean you need to run around in the sunshine with your tongue sticking out of your mouth in order to get it. There are of course other risk factors that can be the cause of oral cancers such as smoking and excessive alcohol use, but in my case the risk factor would appear to be excessive UV exposure and the fact that I have a history of Basal Cell Carcinoma. Thus the concern and need for evaluation. Now I don’t know your particular level of pain tolerance but mine is pretty high. 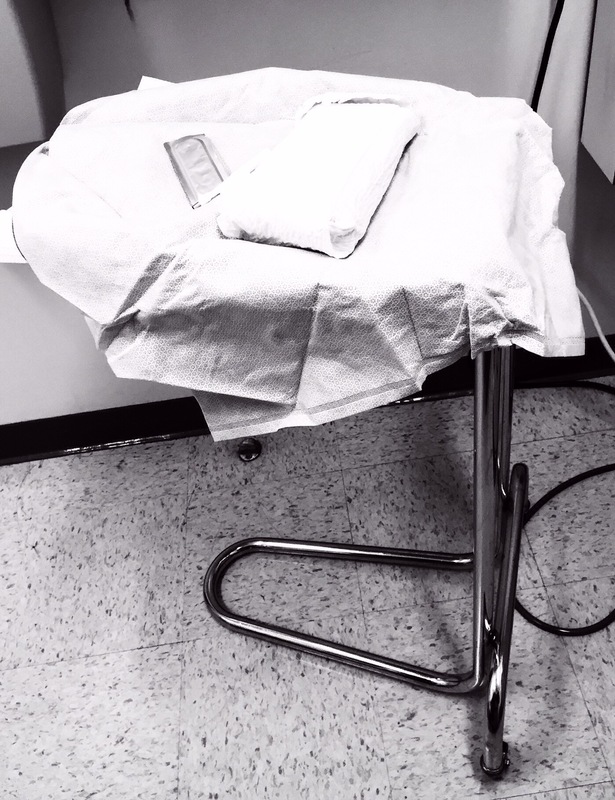 When I had both the biopsy and then Mohs surgery on my face I barely felt the needles that injected the local anesthetic right on the side of the bridge of my nose. Things were very different when it came to my tongue. Think for a second about the times you have bitten your tongue, your lip, or the inside of your cheeks and how much that hurt and continued to hurt for some time. Now multiply that pain by one hundred. The needle stick was not fun. Fortunately my tongue went instantly numb. I have this little anxiety thing about being unable to swallow. Going to the Dentist is difficult enough for me especially when there are suction tubes and a pair of hands and instruments all up inside the small space that leads to my airway. There I was sitting in a sterile room with drool spilling down the corner of my lip, a pair of gloved hands pulling on my tongue and holding it taught while poking and cutting and digging at the mystery spot. I could feel my intense need to swallow begin to rise and I could do nothing about it. Add to that most uncomfortable mix the warm rush of blood and a wad of gauze stuffed in my mouth to stop the bleeding and well, you can probably imagine how I felt. Then There was the tug and pull of the suture needle that went around the wound and up through the center of my tongue. Not once, but four times. Yes, I felt a bit squeamish. The anesthetic wore off two hours after the surgery. That is when I was reminded how much we rely on this funky looking mass of muscle for a variety of things. It was extremely painful to swallow, to talk, to eat, to drink, to sneeze, to cough, to blow my nose. My tongue was swollen and angry and it let me know. For the first three days I could only handle a liquid diet. Protein shakes and water became my friend. The dissolving stitches worked their way loose within a few hours and I became brave enough to cut the long loose ends off by myself before they made their way down my throat. Did I mention how ugly my tongue looked? Ghastly ugly indeed. I have photos but I will spare you. The biopsy results came back within 24 hours and fortunately it is a benign epitheleal tumor in the squamous layer. Yay! We now keep an eye on it over time just to make sure it doesn’t grow back into something malignant. Beyond this little inconvenient interim reminder that I will most likely face additional skin cancers in my lifetime, my full body skin recheck appointment is not until mid-August with my Dermatologist. So after this painful biopsy spot decides to heal completely (it has been one week now and it still hurts to eat, to talk, to swallow) I will be back to living and enjoying life mindfully. Did I mention that in the midst of all this fun I came down with a Streptococcus infection and am now on a regiment of antibiotics? The challenges never cease, but there is still a whole lot of beauty in this world to balance out the little patches of ugly :). 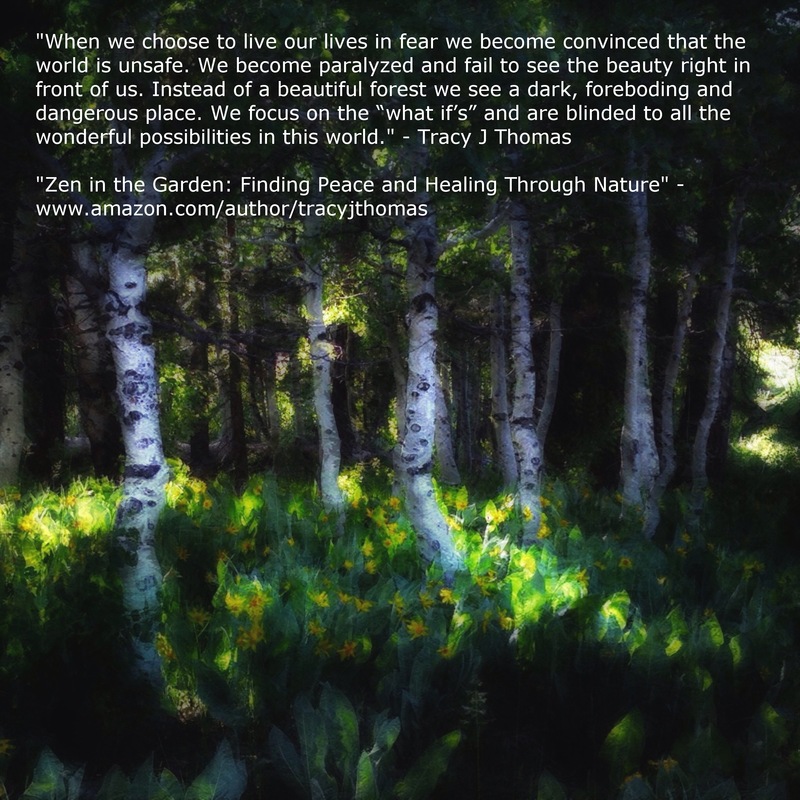 So I wrote and published a short little Kindle e-book called “Zen in the Garden: Finding Peace and Healing Through Nature.” I wrote it after my recent journey with skin cancer, surgeries, and chemotherapy. 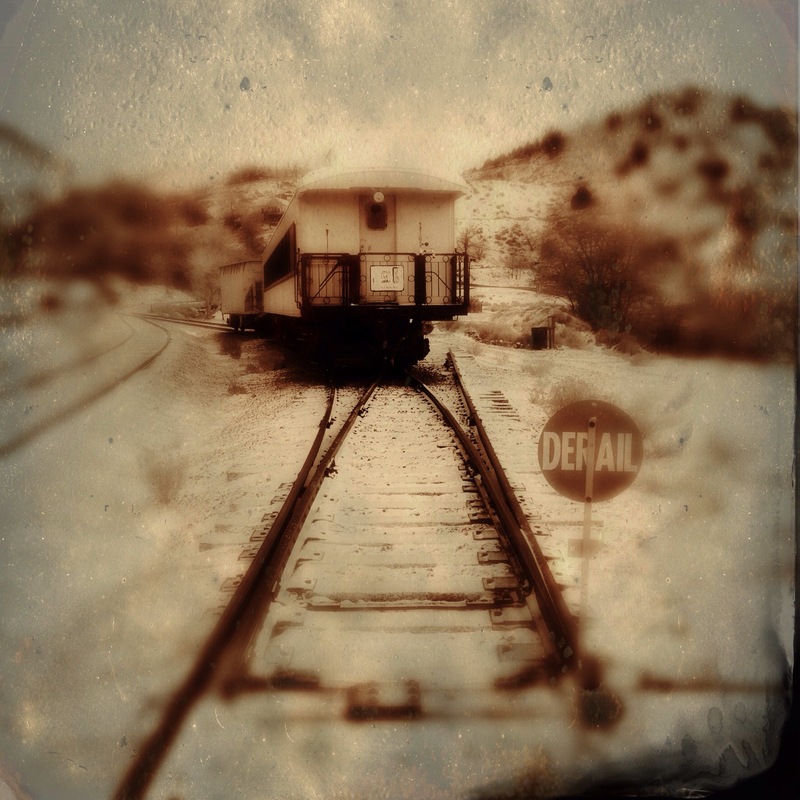 It is meant to provide inspiration and motivation through a combination of written words and my photographs. It also contains some gardening tips and nature challenges. 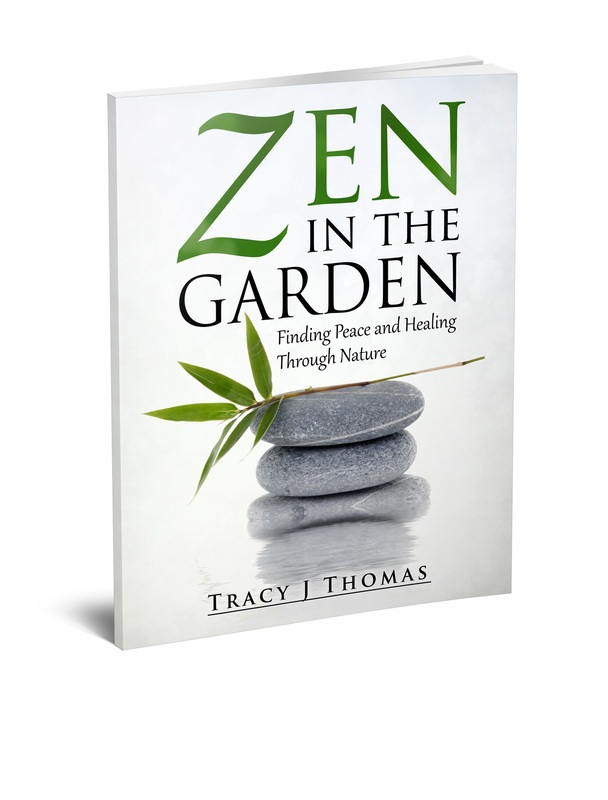 It was published on Valentine’s Day and has already reached the top 100 Amazon Best Sellers Rank in the category of “Spiritual Healing.” All I can say is “wow!” I am humbled and happy and hope this little book can touch the lives of those who are open to its message. 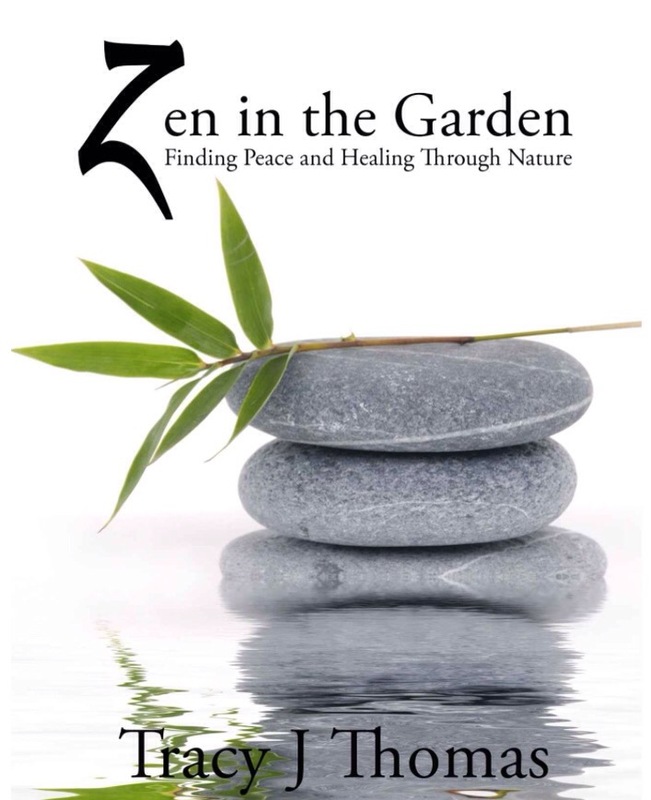 If you would like to read a copy it is currently only $2.99 and can be purchased here on Amazon: Zen in the Garden. If you do purchase it I would love it if you will take a moment to give it a review. Even better, if you can think of someone in your life who might benefit from its message please gift it forward. 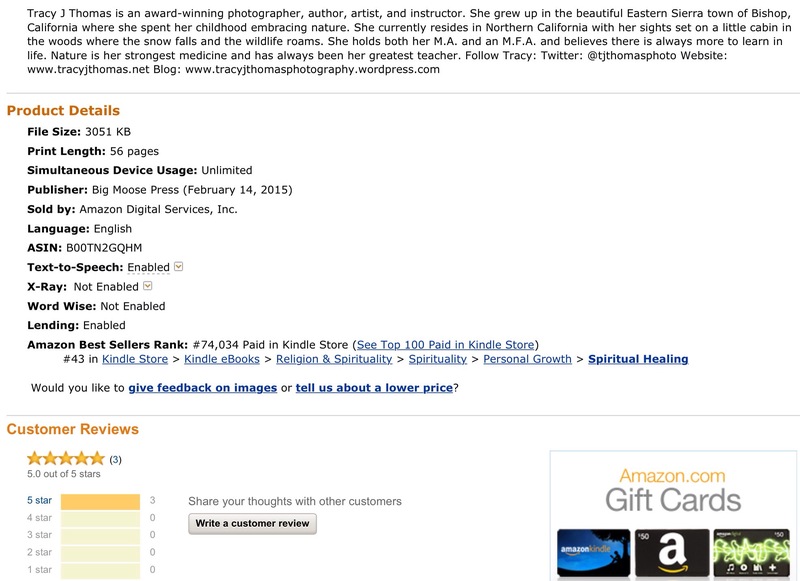 You can do this by choosing “Give as a Gift” on the Amazon book page. Or simply share this post with your friends if you feel moved to do so :). 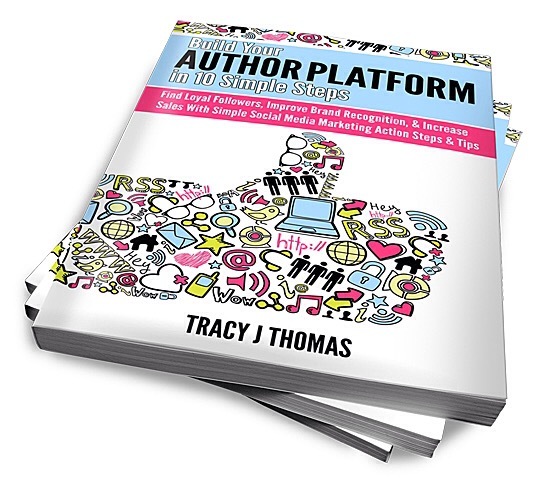 You can also view my Amazon author page here: Tracy J Thomas. Here is an example of one of my photos that appear in this book combined with a snippet of my writing. 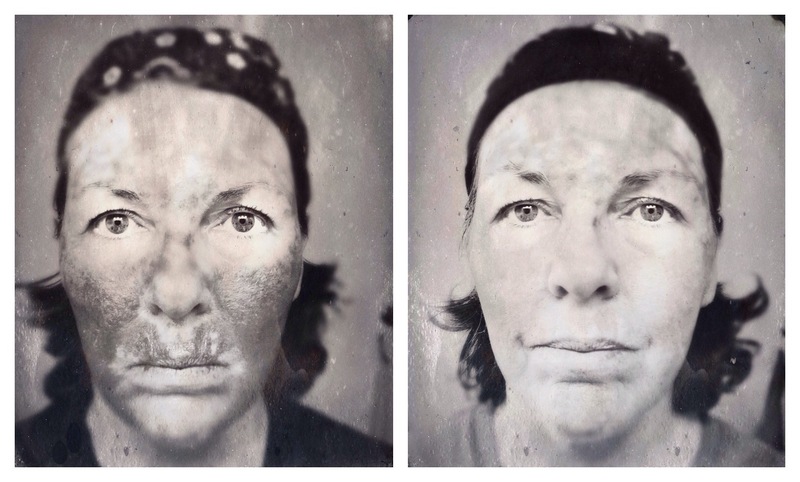 I took a much needed break from all things related to skin cancer following my last post on day 38. My skin has still been in the process of healing over these last eight days and I am just now beginning to look closer to my “normal” self. My forehead has continued to peel and itch and still, after eight weeks, has feint red lines criss-crossing like little pathways on a roadmap. The rest of my face from the nose down looks pretty good but it is still a slight pink and turns a deeper red most evenings. 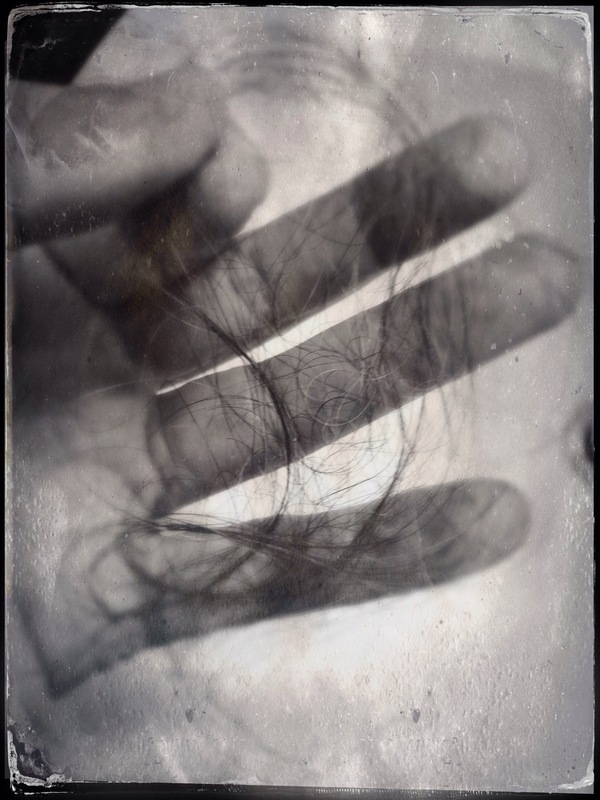 Fortunately my eyebrow hairs and the hair on my head stopped falling out as soon as I stopped treatment. My energy level has improved although I still have occasional bouts of nausea that I believe is due to my body’s efforts to rid itself of the last remaining traces of Fluorouracil. Over Christmas I had my first real trip away from the house in seven weeks and it was heavenly. After being inside for so long everything seemed so fresh and new and fabulous. We even had a white Christmas with a dusting of snow that was the perfect ending to this whole stressful and painful ordeal. When I look back on the past four months from the date of my first surgery, I realize everything I have been through has changed me. I feel the need to embrace the beautiful things in life more and let go of all the crap. I desire to live more fully now instead of putting everything off until later in life when I am too old and tired (or sick) to enjoy it. Although my skin cancer experience so far has not been as harrowing and life threatening as what some individuals have faced, it has definitely rattled my psyche to the point of affecting change. I truly do see things differently now and I appreciate what I have much more than I did before. I plan to continue to make occasional skin cancer posts moving forward as I have my follow up scans and appointments or should anything new arise. 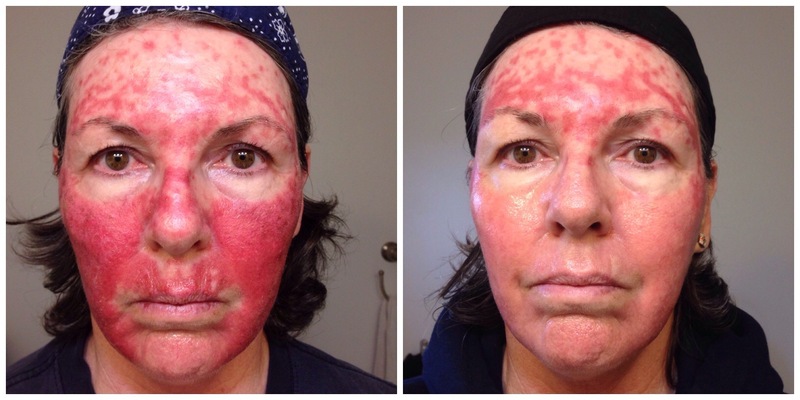 I will also post a timelapse of my face over the course of Fluorouracil treatment as soon as it is clear again. 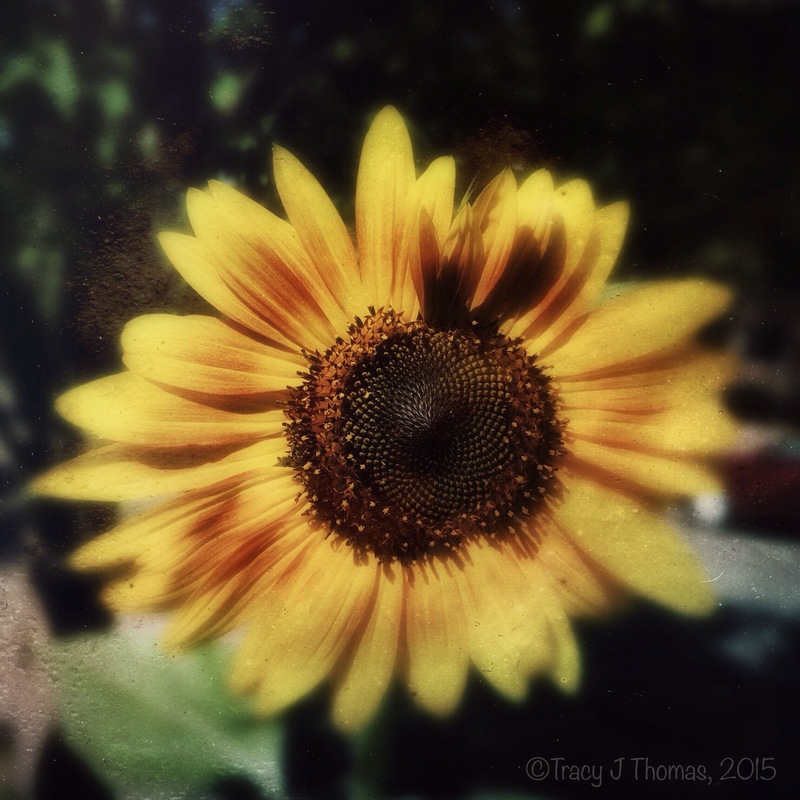 For now I will get back to my regular posting about photography, writing and art. Thank you all for following along on this journey. Your kind words and support helped to make the pain and tedium so much easier to deal with. You are each appreciated more than I can ever put into words. I love the comparison of these two “mug” shots. The first is from when I was in the middle of Fluorouracil Hell and the second is from yesterday, my second day post Fluorouracil. Although I am not smiling in either I see a look of desperation and pain in my eyes and expression in the first image. In the second image my eyes seem clearer and expression softer. That’s part of the beauty of black and white photography as you are not overwhelmed by color and can more easily get to the emotion of the photograph. Monday night, day 35, was my last night of Fluorouracil treatment. I was so happy to put the tube of poison away in the cabinet and out of my sight. It was a long and very difficult five weeks. As much as I would love to say everything is done and I am back to normal now, that is not the case. Days 36 through 38 have been a combination of festering blisters, itching, burning and peeling. Last night was another sleepless night due to a lot of discomfort on my forehead. Today there is a bit less inflammation however it still hurts a lot to wash my forehead especially around my temples where the most intense rows of crusty blisters reside. So if you have Fluorouracil treatment in your future don’t expect everything to go back to “normal” too quickly because as in my experience it won’t. 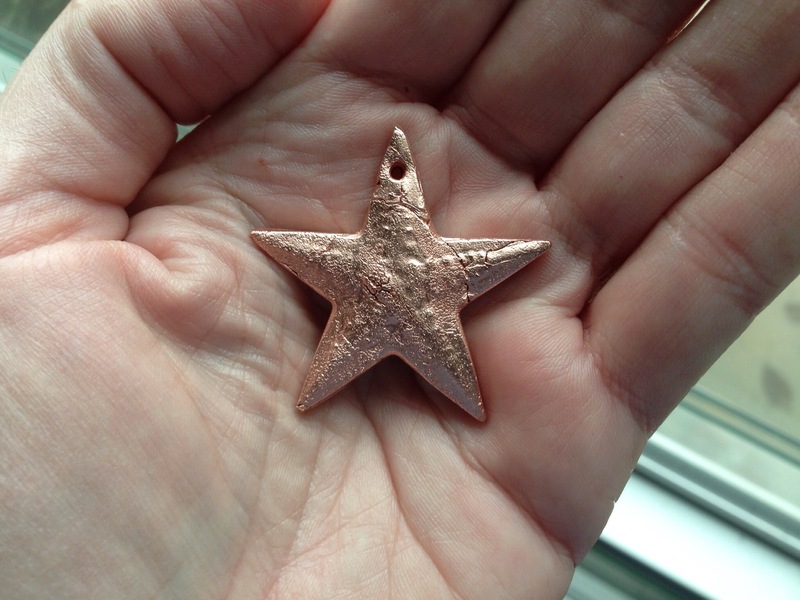 For the past few days I have been playing with metal clay. If you are not familiar with metal clay, it is just like traditional wet clay that can be kneaded, formed, molded, and shaped into whatever you want it to be. It was invented by the Japanese and contains tiny bits of metal, water and a binder. Once fired, the water and binder burns away and the bits of metal form into one solid piece. 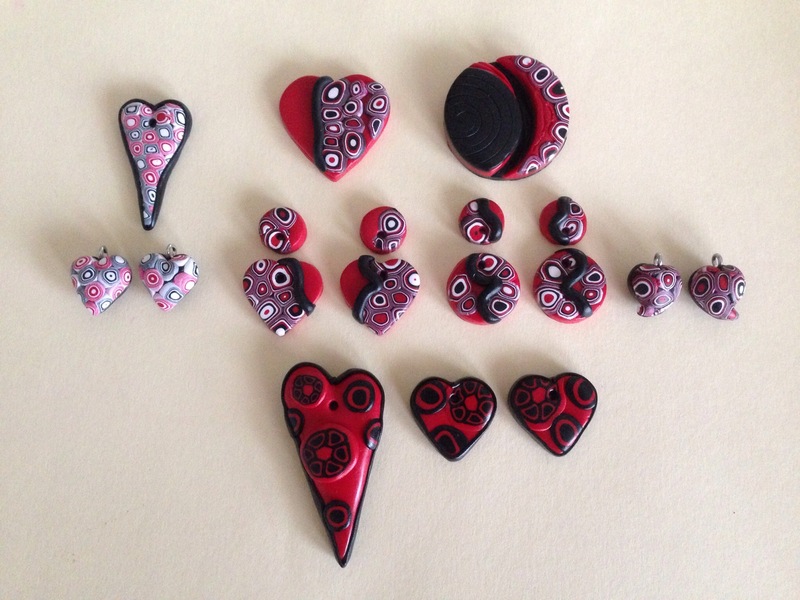 The process of working with metal clay is the perfect analogy for the Fluorouracil Hell that I have just experienced. So it is fitting that I have intuitively turned to this medium during the healing phase. The clay has to go through the process of firing at a very high temperature for a specific amount of time in order to lose the impurities of the binder. Once fired, the piece is quenched in cool water and is then soaked in a pickling solution to remove any scale from the firing. After pickling it is burnished to create a beautiful shine. If firing was incomplete, you can end up with hairline fractures that will cause the piece to break under pressure. If firing was complete, you end up with a strong piece of metal that shimmers and shines with a unique beauty. At this point in my journey with Fluorouracil I feel as if I have come through the fire and am now in the pickling phase where the last remaining bits of scale are being removed from my face. Soon I will be like that piece of shimmery metal. Only time will tell whether my firing was complete or if there are any hidden fracture lines waiting to reveal themselves at a later date. 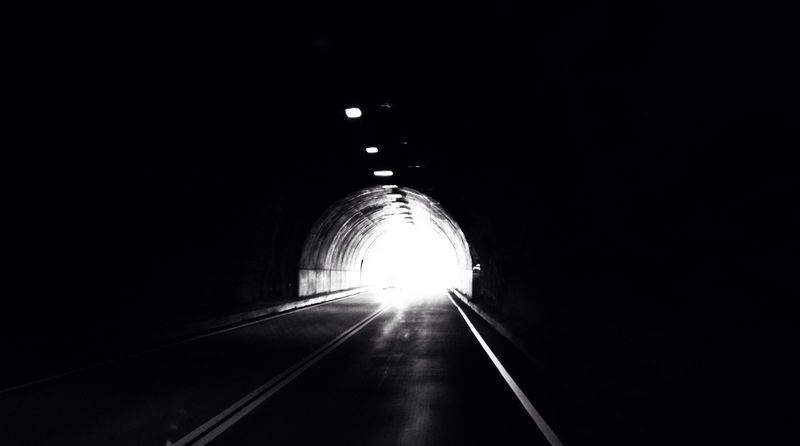 Finally, I see light at the end of the tunnel. Tomorrow night will be my last application of Fluorouracil to my forehead. 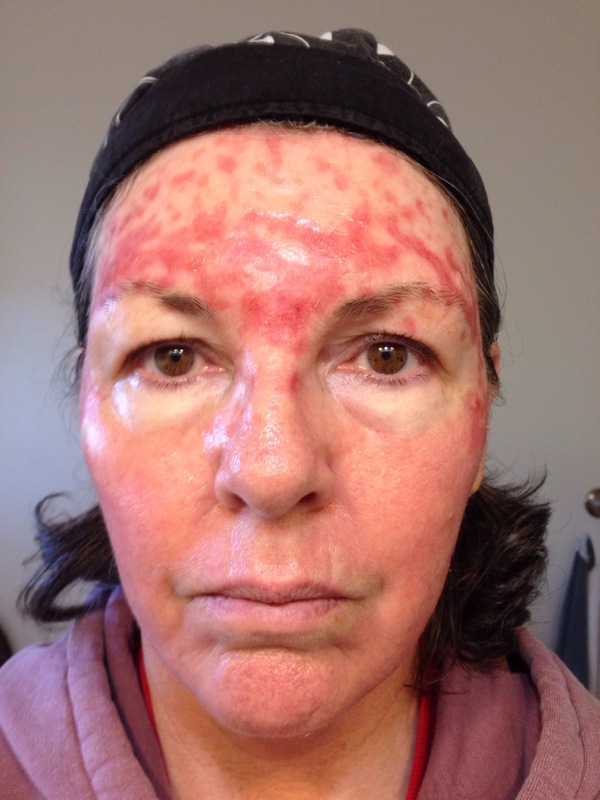 The past few days have seen an increase in inflammation, burning, itching, blistering, oozing and peeling with the larger spots finally reaching erosion phase. The remainder of my face from the nose down is still healing well however there have been a few days when it has become red and a bit irritated again (instead of pink) and the itching returned. However I am now able to go places by pulling one of my winter hats down over my forehead since the rest of my face looks closer to normal now. It’s really interesting to look back on all the photos I have taken the past five weeks to compare the stages. 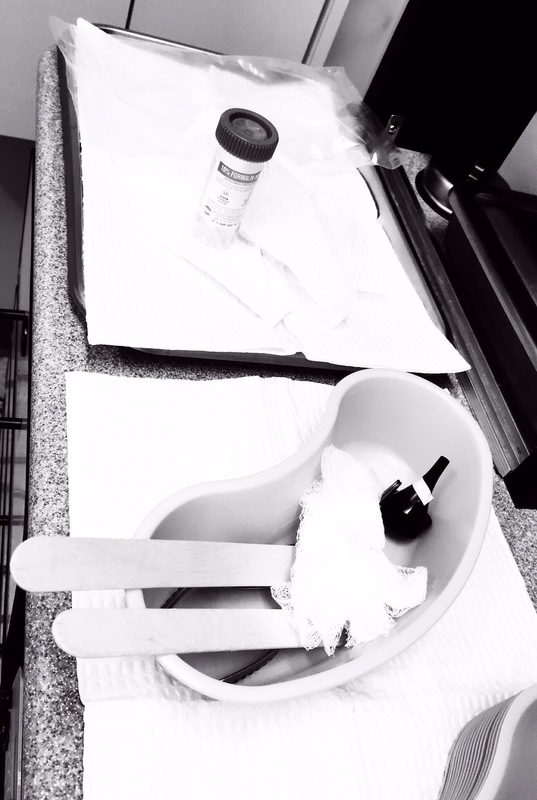 As soon as I am completely healed I am going to put together a little stop motion video to show the progression of the treatment (because those are the silly things that photographers do). There are still a few spots on my cheeks that I have concern about and plan to go back to my Dermatologist after the new year to have them checked along with a new growth that has appeared on my back. But I just want to enjoy the rest of the holiday season without thinking of the possibility of further treatment. Days 29 through 31 have brought much of the same. My face continues to heal from the nose down and the itching and peeling have diminished greatly. My forehead is now on day 31 of Fluorouracil and has become increasingly inflamed and continues to burn intensely and itch. The past few evenings it felt like some little gremlin was running back and forth across my forehead with a pair of spiked golf shoes. Not a pleasant sensation. I continue to lose eyebrow hairs and have most recently begun to lose handfuls of hair from my head. Fortunately I have a thick head of hair and I know this is only temporary. One positive thing I have noticed this week is increased spurts of energy during my days mixed in with bouts of nausea and feeling super tired. It’s kind of like a roller coaster ride. Fortunately these past few days I have actually been able to get a few things accomplished which is a good thing. Of course the most intelligent course of action would have been prevention. But hindsight is just that. Education along with a little dose of reality can make a big difference now that the damage has been done. As I have said before, I am a realist and I know I will more than likely be dealing with skin cancer for many years to come. But now I am very aware and know what to look for in order to remain on top of it. Approximately 36% of all patients find a new basal cell or squamous cell carcinoma within the next five years following treatment. Having a basal cell carcinoma before the age of 60 may also increase the chance of developing other cancers in internal organs. Results showed that people with nonmelanoma skin cancer were at an increased risk of developing the deadly skin cancer melanoma, and that women with nonmelanoma skin cancer were at increased risk of lung cancer and breast cancer, according to the study. So the answer is a definite yes. 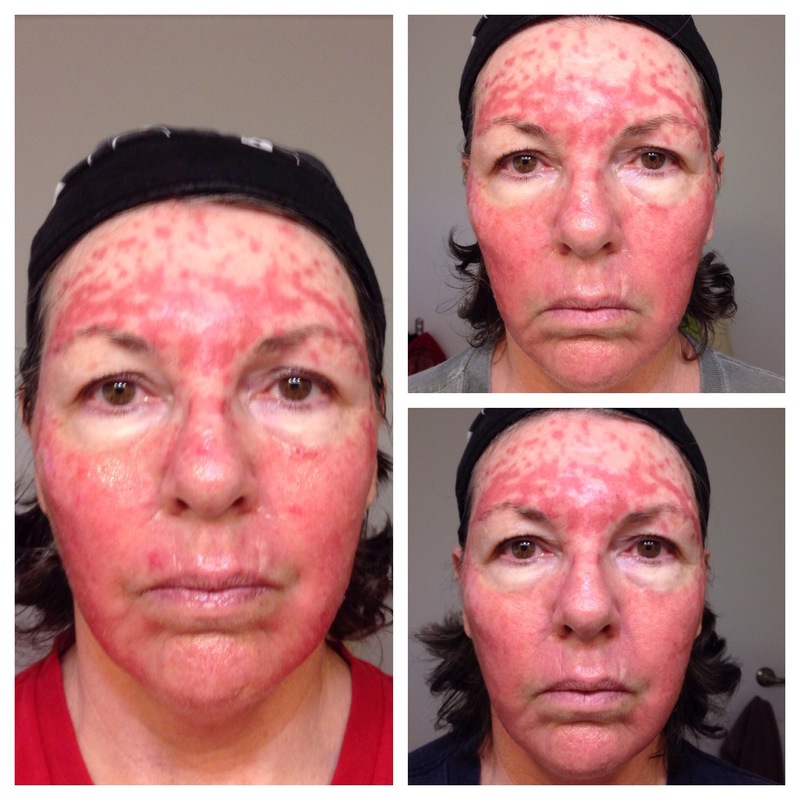 This treatment is, has been, and will continue to be worth the extreme pain and discomfort that it delivers. At times I look at it as penance paid for all those hours of foolishly subjecting my skin to UV rays for the sake of vanity. The last four days have shown steady improvement and healing from my nose down. The Aquaphor has definitely been the savior for the severely dry skin after ending the Fluorouracil. 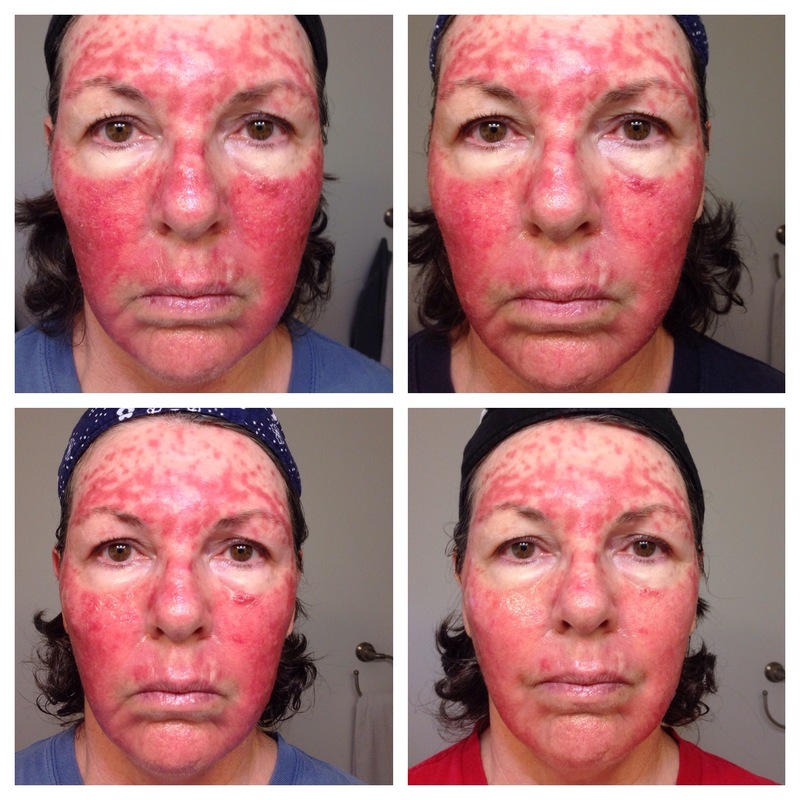 My face from the nose down has continued to blister, peel, burn and itch since stopping the Fluorouracil on Tuesday and today is the first day with a significant decrease in inflammation. My forehead is a different story. Today marks four weeks of treatment with Fluorouracil on my forehead and I still have one more week to go. It is finally beginning to reach the major inflammation stage and is beginning to burn like a mutha’. At least I know what to expect after living through Hell with the rest of my face. Today, day 28, has been a mixture of feeling happy that my entire face is no longer in pain 24 hours a day, super tired from the wear and tear of this whole ordeal, hopeful with the knowledge I only have one more week on the Fluorouracil (which I am now calling “my poison”), and bored after being holed up inside this house for way too long (I want so badly to go outside and run down the street like a crazy lady in the rain). The last few days I noticed another side effect from the chemo. I have begun to lose my eyebrow hairs. I now wake up every morning with new eyebrow hairs stuck to the Aquaphor on my cheeks. Oh goody I say. Just one more thing to make me prettier than I am at the moment. This afternoon I had a window of time where I actually felt good enough to play with clay again. The majority of the past four weeks I have not been able to do much at all except to sit and read and write. Whenever I attempted to do any other projects they were short lived because of the pain and discomfort and general feeling of exhaustion due to lack of sleep. 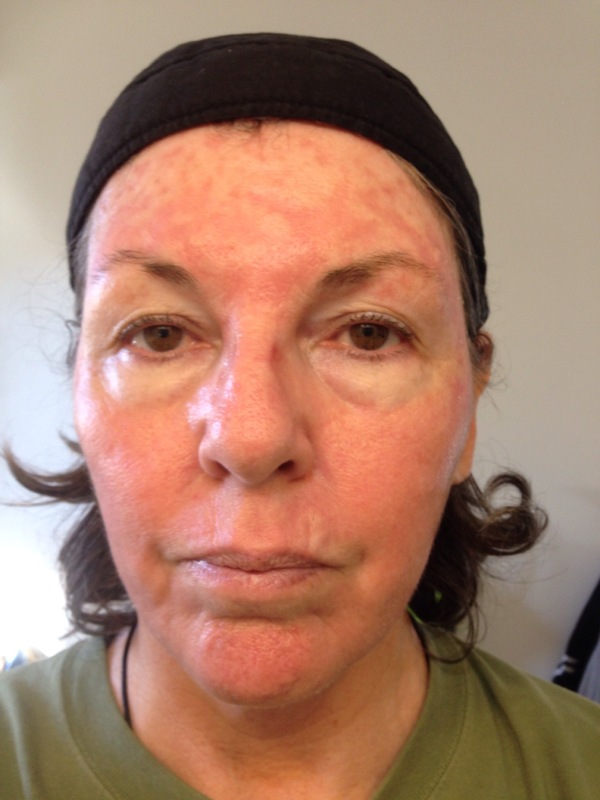 So, if you will be going through this treatment for your whole face I strongly advise you to get all important projects completed before you begin.